Ginavit is a portmanteau— gin [because of the juniper] and aquavit [because of the caraway]. Technically, an Aquavit should derive its primary flavor from Caraway or Dill, but like gin the notion of “primary flavor” has a great deal of variance from one distiller to another. Additionally Aquavit is rarely solely flavored by Caraway or Dill: other botanicals (herbs and spices) are used to create each distiller’s individual recipe. You might see how there’s a lot that these two spirits have in common right from the outset. Many of the traditional gin botanicals (anise for example) are common in Aquavit as well. It’s really those two big names: Caraway and Juniper which largely differentiate what a botanical spirit might be categorized as. So although “Ginavit” smacks of being a made-up word, it is technically accurate. This spirit’s primary flavors are juniper and caraway, although to reduce it to those two botanicals would be a grave disservice. There is MUCH more going on in here. It has a very appropriate for the season, holiday spice nose: just a tad of caraway. Some floral hints as well where Ginavit is reminiscent of Green Hat’s main gin: lemon, cinnamon, a bit of juniper, but predominantly spice. The palate begins with those spices from the nose again but with a much brighter intensity. The beginning, the spice phase of the taste leads with cinnamon, orange and angelica, but those quickly give way to a brighter more floral mid palate. Heat starts coming on and here you begin to pick up more of the aquavit touch: caraway on the edge of the palate moving central with the heat, caraway will dominate the close but not before some bright juniper flashes. Fennel and fir trees here as well. Complex palate with a lot of interesting notes. It doesn’t hit you with the oak notes the way many gins with an aged component does (note, Ginavit uses Apple Brandy Barrels), but in any event the effect the aging brings blends more seamlessly into the overall experience. It doesn’t quite hit you over the head with it: in other words, it’s supremely balanced. I thoroughly enjoyed sipping Ginavit neat. And although I made several cocktails with it, I kept coming back to wanting it neat. The distinctive flavor, delicate warmth and rich spices reward the careful sipper. Sometimes you just crave a gin, but when you crave Ginavit you crave Ginavit. There is no other gin (or Aquavit) that quite rivals or compares. Ginavit and tonic is a delightful pairing, if a tad unexpected, as one does not normally drink Aquavit in this way. The bitterness compliments the caraway, but floral and citrus brightness dominates the palate. Refreshing and a tad summery, despite the spirit’s seasonal nature. The martini was among my favorites among the classic gin drinks. Herbaceous and warm, overtones of sage, lemon, and caraway, a warm somewhat yeasty [rye bread?] finish. Smooth and drinkable, with the bit of heat perceived when sipped neat muted and almost reduced to nothing: astonishingly easy to drink. Flavorful and bright. This is the martini to be sipped by the fire this winter. If you ask me. And I’m assuming if you are reading this, you are asking me. But the Negroni? Absolutely divine. I mostly drink my aquavit neat, but if the caraway compliments the vermouth and Campari as nicely as Ginavit does, I may be missing something. But let’s focus on the Ginavit here: bright, you even get some of the citrusy and spice brightness that comes out neat through here. 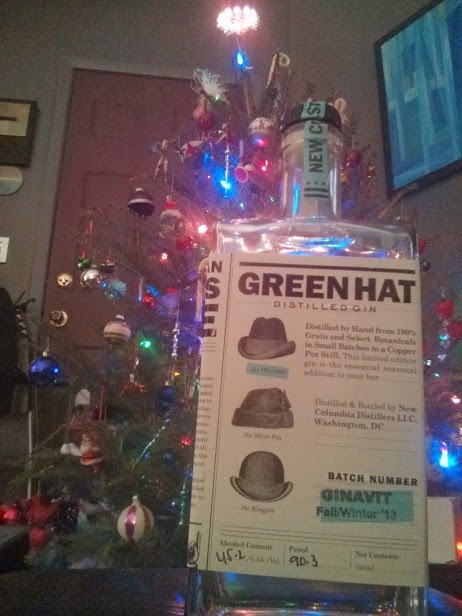 It stands out, and I’m elated to see that like their summer, it’s bottled at closer to 90 (their main Green Hat Gin offering is closer to 80); therefore, you’re able to really taste some of the notes which make Ginavit so unique in the Negroni. Overall, I did a lot of mixing experiments with Ginavit for a holiday cocktail competition, but I have to say that I found many drinks which did better to this spirit than my own homemade drinks. The folks are Green Hat recommended the Martinez, which I think might be a real winner with this one. I also tried their Virginia 75. The maple syrup is a tad intense (I’m using a 100% natural, so perhaps this might be a bit stronger in flavor than if you were using a Mrs. Butterworths or the like) and overpowers Ginavit mostly, save a touch of caraway and general holiday spice. But I’d be lying if I said I weren’t looking for an excuse to drink more maple syrup. It’s great in anything you would like. Negronis and Martinis stand out. I drank nearly half of my bottle just neat. I suggest trying a Danish Aquavit Toast, while sharing with friends and family. In conclusion, I did not find a single gin cocktail where Ginavit didn’t add its own novel touch to. And I loved it. Bold and unique. It was not a classic style gin, certainly. It’s unabashedly modern and contemporary. It doesn’t even proclaim to be a gin outright, the Ginavit sets the stage: this is not going to be like your standard gin. But when I think of contemporary gin and all of the ways you can push it and come up with something truly unique: something that stands out, and stands out distinctly. To draw a parallel: if you drink St. George’s Terroir , it’s a flavor which stands out among gins: there is no other gin like that. Once you have it, you’ll form an opinion about that specific gin. Ginavit is like that: it’s that distinctive and that unique. Ginavit is stunning and remarkable. When I think of what contemporary gin can do when it challenges our expectations, and pushes the boundaries of the category, this is what I think of. A virtuoso performance that combines several things that many distillers are doing well, and just kind of hits it out of the park. Any gin drinker— or lover of just good spirits— should be so lucky to find this in their stocking this holiday season. I live in DC and just picked up this years and it is exceptional. I would give it 5 stars. I usually have it with an ice cube and makes for a wonderful night cap.